The first consequence would be that the Kims and all those connected with the ruling Workers’ Party of Korea would have to flee compatriots angry at years of human rights violations and public executions. So what will Kim Jong-un’s people do without their supreme leader? With a lack of money, food and shelter if the regime collapses, they too may seek refuge in China, Russia and South Korea, but those countries will not necessarily be open to an influx of North Korean refugees. China is already home to an estimated 100,000 North Korean defectors, and is unlikely to want the pressure of more. The Chinese have been concerned about such a scenario for some time, and might reinforce the border with troops, Rand Corporation scientist Andrew Scobell told Foxtrot Alpha. Others may try to travel from city to city in search of refuge, while others could try to cross into South Korea, although if fighting persists in the DMZ, that would be almost impossible. Reunification of North Korea with South Korea, according to Australian National University researcher Leonid Petrov, may mean deep economic and social problems. “In China, tens of thousands of North Korean women are hiding and living in fear of capture by the Chinese authorities,” said Lee So-yeon, a former soldier who fled her country in 2008 and is now a leading activist in South Korea. Many of the women are sold to men in China with prices ranging from US$4,000 for women in their 20s to US$2,000 for those in their 40s. “The greatest fear for women who are forced to leave is deportation to North Korea,” she said. Those who are caught by the Chinese authorities and sent back face the prospect of punishment meted out in prison camps, correctional training centers or labor training camps. Life is especially harsh for women who have become pregnant by Chinese men, with some of them facing execution, she said. Lim Hye-jin left her country in 1998 during the famine crisis. Once she crossed into China with a broker she was forcibly married to his brother, before becoming pregnant and was later rounded up by Chinese officials while working at a market. After repatriation she escaped back into China, but was brought back to the North once again. Eventually, she made a third escape and arrived in South Korea in 2002, but without her daughter. North Korea: With information comes education and a popular uprising? [After Thae defected his diplomatic post along with his family] his 19- and 26-year-old sons’ first concern was whether they could freely browse the Internet. “You can go to the Internet, you can do Internet games whenever you like, you can read any books, watch any films,” Thae said he told them. That’s not the way of life in North Korea, where fewer than 1 percent of the population has Internet access. Foreign books, films and information are banned — and TV only broadcasts propaganda. Breaking down the censorship and surveillance state from within, Thae believes, is the only way to bring down North Korea’s nuclear weapons-obsessed leader. With information comes education, Thae says — and that can lead to a popular uprising. “Once they are educated to that level, I am sure they will stand up,” Thae told reporters. A shortwave radio station called Free North Korea Radio has been delivering information from outside the country since 2005, broadcasting from the second floor of a multipurpose building just outside Seoul. “The leaflets, USBs with films [stored on them] can be introduced to North Korea. So the ways of educating North Korean people for people’s uprising is also evolving,” Thae said. This kind of tactic is far more effective than any military action, Thae, the defector, said. Any surgical or preemptive strike on the North in an attempt to eliminate its nuclear facilities would only turn South Korea — a longtime U.S. ally where 28,000 American troops are based — “into ashes,” he told reporters. Joo Chanyang once sold cigarettes and socks to raise enough money to escape oppressive North Korea. She then trekked 2,000 miles through China, risking imprisonment and execution, to reach the safety of South Korea. 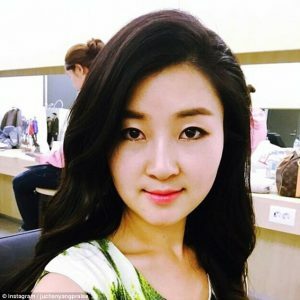 But now Joo is mobbed by fans on the streets of Seoul, mingles with celebrities and has thousands of social media hits as she is appears with other North Korean defectors on a kitsch reality TV show, ‘Now On My Way To Meet You’. Featuring 15 defectors from Kim Jong-un’s brutal regime, they discuss their former lives: from the horrors of public executions and famine to beauty products and North Korea’s drinking culture. Panelists like Joo became overnight stars in South Korea … by singing, dancing and mocking feared dictator Jong-un. Despite her new found fame, Joo insists she is just an ordinary person. “The young generation still think North Korea is a foreign country. … With more exposure, people will get to know North Koreans better. … The government is bad, not the people… Not everyone worships Kim Jong-un. Prime Minister Shinzo Abe said that Japan’s government is drawing up contingency plans in case a crisis on the Korean Peninsula sends an influx of refugees to Japan. Abe told a parliamentary session that the government is formulating measures including protecting foreigners, landing procedures, building and operating shelters, and screening asylum seekers. The government has been also working on evacuation plans for about 60,000 Japanese from South Korea in case of a crisis. Last week, National Security Council members discussed how to deal with a possibility that armed North Korean soldiers pretending to be refugees may try to enter Japan, Kyodo News reported. According to one scenario, a US military action sends a massive number of North Korean refugees to the Japanese coast in boats, but some armed soldiers hiding among them could plot terrorist activities after landing, Kyodo said. China should immediately reveal the whereabouts of eight North Koreans it detained last month, Human Rights Watch said Monday, adding they risk severe torture if they were returned to North Korea. “By now, there are plenty of survivor accounts that reveal Kim Jong-Un’s administration is routinely persecuting those who are forced back to North Korea,” said Phil Robertson, deputy Asia director for Human Rights Watch. China regularly labels North Koreans as illegal “economic migrants” and repatriates them based on a border protocol adopted in 1986. The group it highlighted — which includes at least four women — was detained by Chinese officials in mid-March after they were stopped for a random check in Shenyang, in northeastern China. Human Rights Watch said that on the basis of information from sources it considers usually reliable, the group was still believed to be jailed in China. But it feared they may soon be returned to the North since “most repatriations happen two months after detention”. “There is no way to sugar coat this: if this group is forced back to North Korea, their lives and safety will be at risk,” Robertson said. Seoul’s foreign ministry did not confirm the HRW account, saying its protocol was not to publicly comment on individual refugee cases for their own safety and to protect diplomatic relations. “But we closely coordinate with a nation involved when a problem involving North Korean refugees arises,” it said in a statement, and was in general “doing our best to ensure the safety and safe transfer of those who wish to come to the South”. More than 40 North Koreans, including children and pregnant women, have been held by China over the past nine months, Human Rights Watch said, and at least nine forcibly returned to the North. North Korea detained a US citizen for unknown reasons as he was planning to fly out of Pyongyang International Airport on Saturday morning. The detention was confirmed by Martina Aberg, deputy chief of mission at the Swedish Embassy in Pyongyang. The embassy represents US interests in North Korea, since Washington and Pyongyang do not have direct diplomatic relations. The US State Department on Sunday said it was working on the case. – Otto Warmbier, 21, a student at the University of Virginia, was detained at Pyongyang airport on January 2 last year after visiting the country with a tour group. He has since been sentenced to 15 years of hard labor for allegedly removing a political sign from a hotel wall. – Kim Dong Chul, a naturalized US citizen of Korean origin, was arrested on October 2015. Last year, North Korea sentenced him to 10 years of hard labor on espionage charges. Over the rabble of tourists at Dora Observatory, a lookout in the Demilitarized Zone between North and South Korea, the sound of a rousing opera can be heard. Propaganda and music is broadcast by the north from across the border; slightly further west, the south plays their reply: Celine Dion and Kpop. Kim Hwa (not her real name) is looking back at the country she fled in 2009. Hwa feels duty-bound to educate the public about North Korea, and volunteers part-time to take day trips to the DMZ with tourists, answering their questions on life in the north and her escape from the regime. She has fond memories of the Kim Il-sung era, when she says there was no economic difficulty, free medical service, free education and the food supply was consistent. The shift begins, for her, in the second era, that of Kim Jong-il, when she saw the nation’s budget move towards nuclear development and military spending, and away from food distribution and energy supply. The crumbling of the Soviet Union as well as environmental factors led to a massive famine in North Korea from 1994-1998, in which about 3 million people lost their lives. At the time Kim Hwa was a lieutenant-colonel in the navy, with 700 soldiers under her. She lost 50 troops to the famine and was denied help by the government. This was the first time she thought the government would crumble, and the first time she “started having doubts about North Korea”. To feed her troops, she decided to sell a car on the black market to buy proper food such as goats and rabbits. One of her colleagues reported her and she was discharged in 1999. Spending 20 years in the military meant she had been somewhat sheltered from general society and thought the worst of famine was confined to the armed forces. She was greatly surprised when she returned home. After being discharged from the North Korean navy as a lieutenant-colonel, North Korean defector Kim Hwa (not her real name) was given a visa that enabled travel to and from China. At the time, North Korea was always low on medicine, so for medical purposes everyone had to buy illegal drugs in village markets. Prescription drugs and opium as well as marijuana were readily available on the black market, smuggled from China. “There is nobody who works in trade with China that doesn’t trade drugs,” Kim says. It is so commonplace that she did not even consider the risks, and she and a friend began doing it. In late 2009, Kim Hwa’s partner along with other drug dealers were lined up and executed by shotgun. Kim could never return to her homeland. She traveled through Laos and Cambodia before seeking asylum at the South Korean embassy in Thailand, arriving in Seoul in December 2011. She was safe from the regime, at the cost of leaving her mother and two younger brothers behind. As a former high-ranking military officer, Hwa faced a lot of suspicion from South Korean authorities before she was allowed into the country. Defectors typically face a week-long investigation but she was questioned for three months, and was locked up throughout the process. [Finally] she was cleared and flown into Incheon airport. Just last week, Kim Hwa attended a North Korean defectors meeting in the South and heard that about 100 defectors are arriving each month. It’s only a third of what it used to be a few years ago, but she finds it staggering considering the strengthening of border defense, increased land mines, higher broker fees for smugglers and heightened dangers associated with defection. For her the message is clear – enthusiasm for defection is tremendous.